Bureaucracy has long been a cornerstone of advanced industrial societies, and a defining feature of modernity. At the same time, many commentators from all quarters argue that it is on the wane in this post-this or that world; or that if it isn't, it should be dismantled to free up organizations, enterprise, and innovation. But do we live in a more or less bureaucratic world? Do contemporary forms and means of communication undermine or modify bureaucracy, or does technology create new 'iron cages' and forms of control? If bureaucratic models of organization are abandoned, do we run risks of organizational failure and inequity? 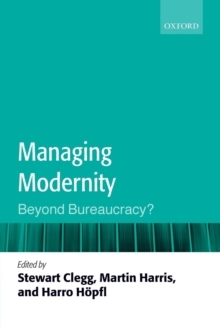 Are there certain moral, professional, and social values associated with bureaucratic models?This book explores these issues in different organizational contexts - public administration, the National Health Service, the modern firm and corporation - and offers new insights into enduring questions. It will be an invaluable resource for academics, researchers, and students in organization studies, management, public administration, and sociology. The volume will also appeal to managers, planners, and policy makers who deal with these challenges.